Blotting board is a neutral, soft, unglued, minimally pressed, highly absorbent, acid-free board without optical brightening agents. It consists of a high proportion of cotton fibres. Thanks to the open capillaries of blotting board, fluids can be absorbed very quickly and effectively. KLUG-CONSERVATION blotting boards offer a particularly high capillary rise of over 150 ml in 10 min. When treated appropriately, blotting boards can be used for many processing cycles in restoration processes. 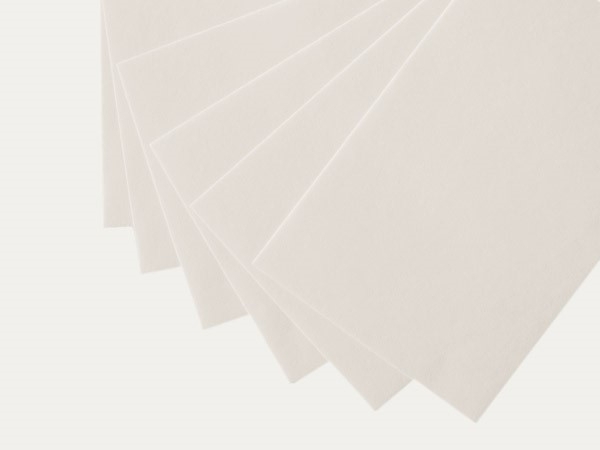 A highly absorbent, acid-free and soft-textured fleece board with good wet-strength and a high cotton fibre content, suitable for preservation and archival storage purposes. The board is pH-neutral and manufactured without the use of optical brightening agents.